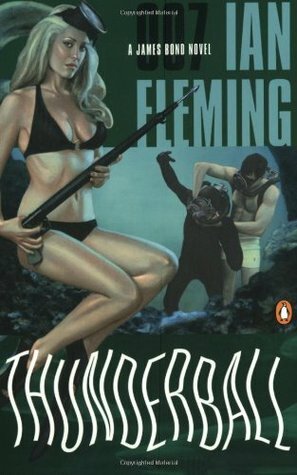 After a disappointing outing in Goldfinger and an appetizer of juicy vignettes from For Your Eyes Only, Fleming has brought Bond back to all his former, pulpy glory in a new adventure in an exotic locale with a brand new enemy–SPECTRE–in the ever-thrilling Thunderball! The first few chapters seem to play with the audience’s criticisms about Bond: M thinks he’s tired, possibly washed-up, and sends him on a mandatory holiday at a health spa in the country learning to fast, eat vegetables, cease smoking and drink, and other “un-manly” things that were the new health craze at the time. The retreat really serves as a reboot in the series. Bond casually investigates a fellow inmate, the inmate tries to kill Bond in retaliation, and Bond responds in kind. Very typical “tough guy” Bond that we all know and love. All the while, Bond begins to soften somewhat and take on a more healthful visage; he returns from the retreat energetic and healthy, much to the delight of M but receiving the uncharacteristic reprimand from his faithful housekeeper who knows more about his life than Bond might’ve suspected. After the delightful opening act, physically rejuvenating Bond and reminding the reader what made them love the character in the first place, we are introduced to our new villainous organization, SPECTRE (the SPecial Executive for CounterTerrorism, Revenge, and Extortion)–led by Ernst Stavro Blofeld–to take the place of (the now, apparently, defunct) SMERSH in a more “realistic” capacity and, ostensibly, to allow Fleming more freedom to write around the confines of the Cold War rather than from within. It’s a bold move, and one that–as we look back historically–has worked out well for the franchise staying relevant. The novel is paced well, much like the early films, and reads like one of Connery’s outings. Bond is back to being his introspective tough guy, and Felix Leiter returns in a starring role (hook, peg leg, and all). The stakes are the highest that they’ve ever been in a Bond novel, and the action stays intense throughout!